Are you renovating your bathroom but don't want the hard work of taking the tiles off the walls or floors? With venetian plaster, you don't have to! 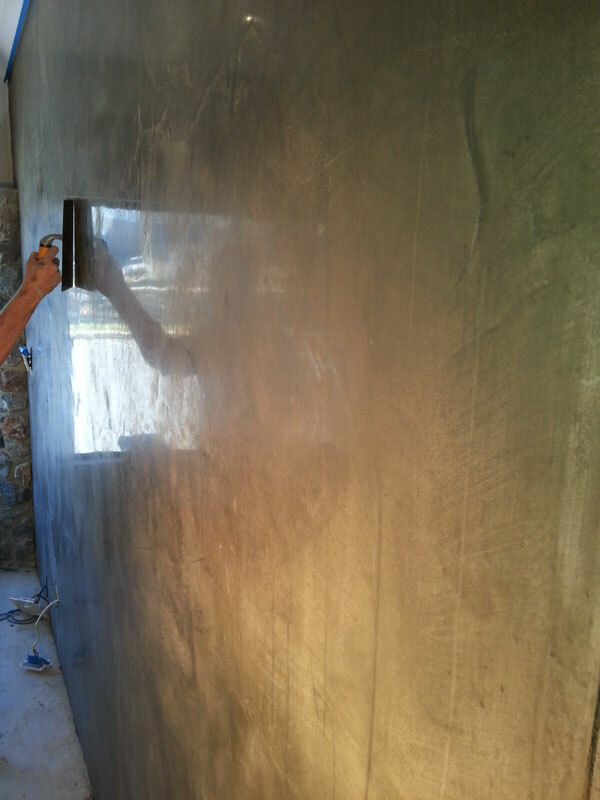 Venetian plaster is a traditional, high-class art-form that creates a smooth mirror-like finish. With almost limitless colours and textures to choose from, it's the perfect option when you need a fresh new look. Venetian plaster is a lime based product used as wall, floor and ceiling finish. It is applied with a trowel in thin multiple layers to both internal and external areas. After this it is burnished to create a smooth surface with the illusion of depth and texture. When applied correctly Venetian plaster becomes rock hard, durable and has a highly polished, marble like finish. It is especially useful in areas that would be too expensive to use real marble such as columns, corbels, fireplaces and curved walls. Venetian plaster can be tinted or coloured using natural or synthetic colours. This can be useful when trying to find a specific colour of marble or when wanting to use a colour that may not exist naturally. Marmarino simply means the lime made from river rock in Italy. This lime is much stronger than the lime in Australia which is made from limestone. It comes in different polishes which can start from a course finish through to a high shine highly polished finish called stucco. Marmarino is hygienic, strong and extremely suitable to have in your house as it can go over any surface including tiles. It is suitable for feature walls, floors, ceilings, columns, and corbelling. Stucco 34 is a cement-based product that is suitable for exterior finishes, and is most commonly used to replace "Cement dado", which is not recommended for external use! Like marmarino, stucco 34 is also not susceptible to cracking for at least 10 years. Stucco 34 is harder than concrete but also has flex, which is why it will not crack like traditional cement dado. It's available in various colours and finishes, and is suitable for wet areas, as it gets harder under water! Venetian plaster or Marmorino as it is more commonly known is a classic plaster which dates back to ancient Roman times. There is evidence of it today in the villas of Pompeii and in various buildings around Italy especially throughout Venice. The first ever record of Marmorino being used was in 1473 on a building contract with the nuns of Santa Chiara. Marmorino became popular as it had an excellent drying capacity and was naturally mildew resistant. This was especially important through Venice as it was built up over water. It also became popular as at the time it used the terra cotta scraps from roof tiles as well as left over marble and stone which were in abundance. This made it a lot easier to use and transport around Venice as carrying the equipment and materials needed for regular plastering such as sand was near impossible. Typically, marmorino was white in colour to imitate the stone of Istria, which was most often used in Venetian construction; it was occasionally decorated with frescoes (mural paintings on plaster walls) to imitate the marble, which Venetian merchants brought home from their voyages to the Orient. Marmorino maintained its prestige for centuries until the end of the 1800’s when interest in it faded and was considered only an economical solution compared to that of marble. At the end of the 1970’s however, thanks in part to the architect Carlo Scarpa, did this finishing technique return to the interest of the best modern architects. Throughout the world today, this high end finish has become extremely popular amongst the top architects and designers. Venetian Plaster is an eco-friendly breathable mineral covering that is inflammable, mildew resistant and fade resistant. It has been used for hundreds of years throughout Europe and the rest of the world on old historical buildings such as churches and palaces both inside and out. Venetian plaster creates surfaces of elevated aesthetic value wherever it is used. Venetian Plaster finishes are highly durable and can be applied to almost any surface such as drywall, tiles, wood panelling and brickwork. Due to its high resistance to humidity and moisture it has been the one of the number one choices for use in kitchens and bathrooms. There is a wide range of design possibilities when using Venetian Plaster. From the smooth contemporary look to a more rustic antique finish. Anything can be possible when using Venetian Plaster; it’s just up to your imagination. PLEASE NOTE: As this is a natural product the mineral composition may in some circumstances (usually when exposed to the harsh weather conditions) be subject to irregular spotting and discolourations due to the uneven absorption of the product during the applications process and also over time due to the exposure to various environmental factors. The most common reaction is a superficial whitish patina caused by heavy rain especially that which has acid in it. This does tend to disappear over time and it is important to remember that this is in no way considered an imperfection but rather a characteristic of the products natural appearance. Feel free to contact us to discuss the various options. Alternatively, go to venetiandecorators.com.au to find out more about this amazing product.